Every runner appreciates the significance of numbers. They denote distance, pace, PRs, streaks, start-line times, goals, followers on Strava, and qualifying standards. We fixate over them, strive for new ones, and often define success by them. As a lifelong runner and professional bean counter, Steve Loftis understands the importance of numbers, both on and off the road. He began running in high school and found a renewed interest in 1978 while training for a backpacking class at UNL and joined the Lincoln Track Club. Since then he’s logged over 50,000 miles, participated in more than 50 Lincoln Track Club–sponsored races, and ran as a member of the National Guard Marathon team. In addition to road races, Steve travels the country doing “rucker” events, and in 2019 plans to participate in the Bataan Memorial Death March for the seventh time. Haven’t heard of that race before? It’s a marathon in the desert with the added enjoyment of a 35-pound rucksack on your back. At 60+ years of age, he has brought home the gold or silver every year in the 50 and over age group. How do you like those numbers? While we’re impressed with Steve’s numbers on the road, today we’re recognizing him for his dedication to numbers off the road. In 2015 Steve volunteered his financial aptitude when he joined the LTC board as treasurer, where he was tasked with updating the books and overhauling the financials for the club. His dedication to this task was apparent immediately, and it wasn’t long before the board was setting PRs in financial analysis. Steve helped establish not only a direction but a strategy for managing our financial assets. He implemented an enormously important asset allocation and investment strategy to help ensure the long-term financial stability of the club, which will ensure the club is able to continue its philanthropic endeavors in the community for many years to come. Steve’s detailed financial reporting also brought a new level of understanding and analysis to board operations. In addition to running both monthly and annual financial reports, he works closely with race directors to develop event-specific analysis. Never one to rest on his laurels, Steve has continued to develop new tools to help race directors and the club understand the nuances and complexities of race financials. His willingness to develop these tools and partner closely with race directors has resulted in better event planning and more informed financial decisions. In addition to dedicating his financial services, Steve has been a loyal volunteer at LTC events since he joined the club in the ’70s. Much like the mail carriers, “neither snow nor rain nor heat nor gloom of night” has kept him from volunteering. Steve’s phenomenal attention to detail and generous dedication of time continue to be a true gift to the board. 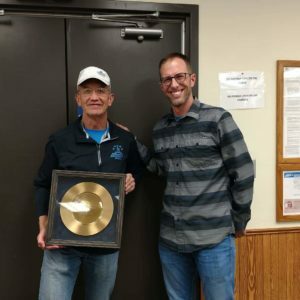 We recognize Steve today with a 2018 Distinguished Service Award for his tireless service as treasurer and for keeping our numbers off the road in order. We’re looking forward to cheering him on as he continues to pursue the numbers on the road.